Joel Garner, the former fast bowler, has been appointed interim manager of West Indies for the upcoming tour of Sri Lanka. He had earlier been manager of the team from the tour of Australia late last year till the end of the home series against South Africa earlier this year. 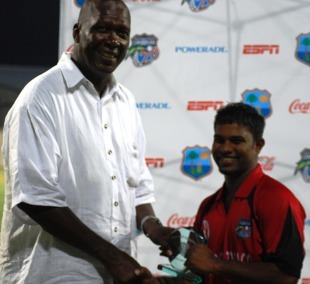 "It is an honour to serve West Indies cricket in whatever capacity I am asked," Garner said. "As always, I am willing to do what is required to see West Indies cricket move forward." Garner, 57, played 58 Tests and 98 ODIs between 1977 and 1987 and was an integral member of Clive Lloyd's all-conquering West Indies team. He is the president of the Barbados Cricket Association and a director of the West Indies Cricket Board, which is still looking for someone to take up the manager's post for the long term. West Indies cricket is going through a difficult time. Last month, their opener and then captain, Chris Gayle, and two key allrounders, Dwayne Bravo and Kieron Pollard, turned down central contracts offered by the board. In response, the board removed Gayle from captaincy and put Darren Sammy - who has played only eight Tests - in charge. Sammy's first chance to lead the team will be on the tour of Sri Lanka, which starts with a three-day warm-up match in Colombo from November 10.